Here I’ll show you how much abuse North American Pitcher Plants can really tolerate. From ripping off all their winter leaves to butchering them into pieces, Sarracenia really showcase how resilient carnivorous plants can be. Remember: a meat-eating plant that lives in the dangerous swamps of the Deep South can probably tolerate some serious manhandling. Sarracenia are my favorite carnivorous plants to work with precisely because I can take my deepest frustrations out on their crunchy little rhizomes. Rarrrrrrgh! 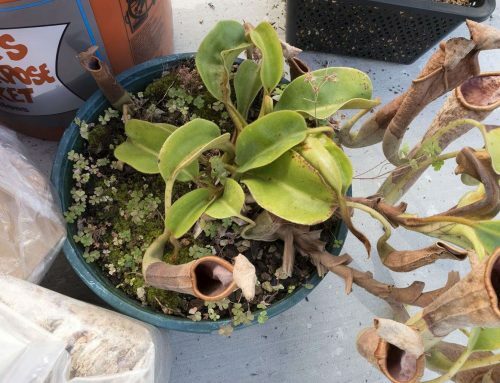 I just got done dividing and cleaning several hundred plants for my employer, which means a) I’m covered in pond scum and desperately need to shower, and b) right now I’m all about talking shop about chopping up pitcher plants! 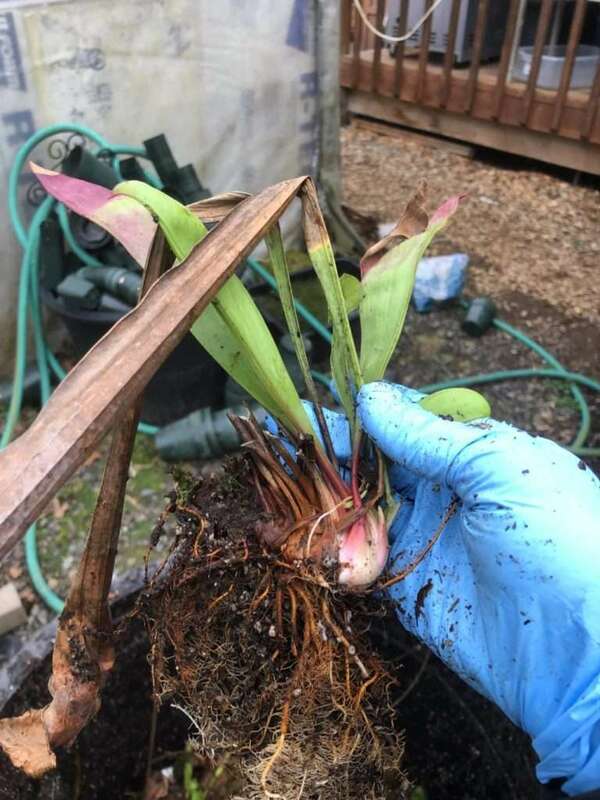 What I’ll be doing in the pics below is fully trimming and dividing a large, mature Sarracenia. You do not need to divide or transplant your plant every year, but if you do, it’s best to do it all at once, while the plant is dormant. 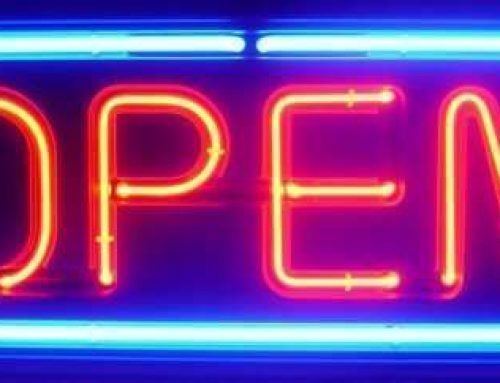 When a plant is still dormant, its “metabolism” isn’t at risk for being spent on both growth, shock, and healing at the same time. Shock is a general term for stress after transplantation. Dividing a plant in winter means the plant is numb to shock, and divisions won’t suffer an unbalanced growing season as would a plant divided in mid-summer. Just remember to give them adequate water immediately after division, or keep divisions stored in a bin of water until you’re ready to plant them. 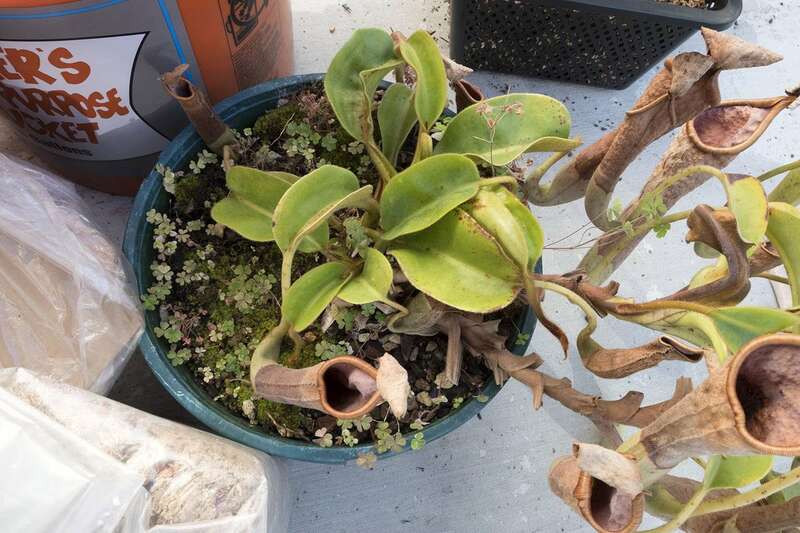 Also, you can divide healthy Sarracenia at any time of the year, but winter division means a more consolidated care routine for you, and a consolidated growth budget for your pitcher plant. I chose this plant because the rhizome had been pushing up against the sides of the pot, and in some places had started to arch over the rim itself! I also wanted to split this plant up so I could have more of it. It could be kept undivided, and I could transplant the whole thing (cleaned of old soil and weeds of course) into a larger pot so that the roots grow more (wider and deeper pots generally give you larger plants). For the sake of this page however, this S. oreophila hybrid gets to be split apart! First, remove all that old soil. I use a bonsai root hook, which is great for getting in-between all those hard-to-reach places. Plus, you can really get your shoulder into it! A rhizome-bound Sarracenia. Looks like a good source of starch. Bust that puppy up! A bonsai root hook transfers the effort from your fingers to your shoulders. Unwashed divisions, ready for cleaning and trimming. 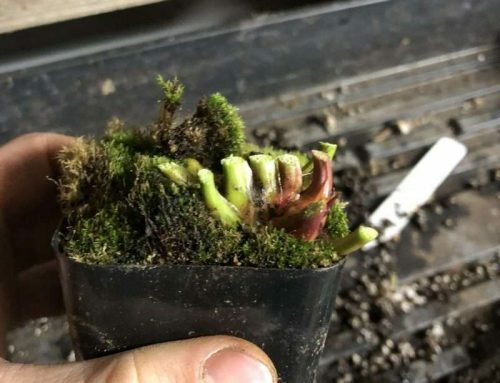 Dormant, healthy Sarracenia are basically numb to root disturbance, so don’t worry too much about ripping off roots (but keep it to a minimum!). Sarracenia roots are extremely robust, ropey things that can tolerate being moved around – they don’t come off easily. 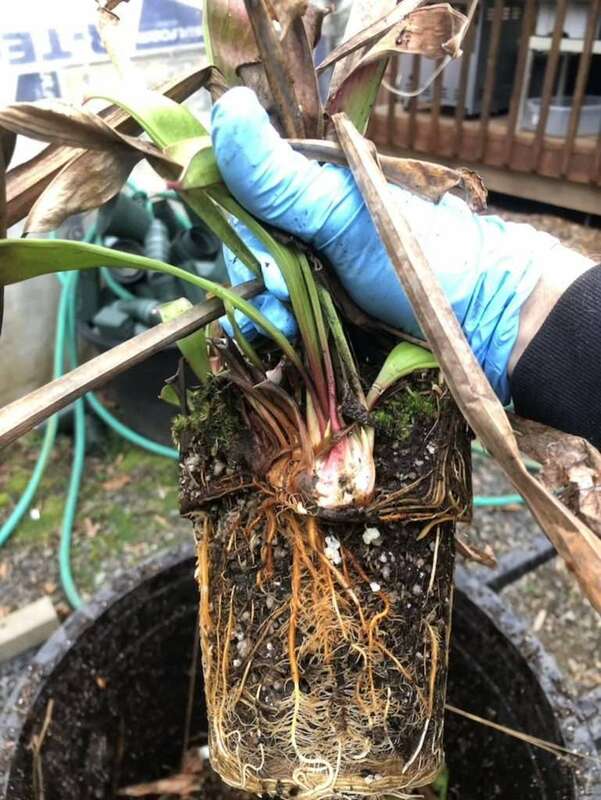 At the nursery I work at, not a single Sarracenia has suffered from root disturbance alone no matter how I handle them. 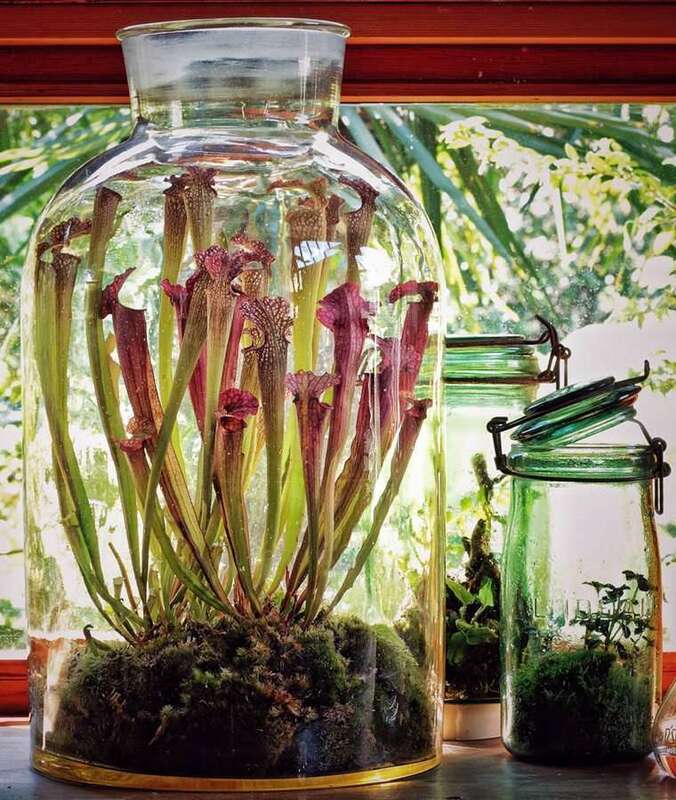 The only serious setback that Sarracenia experience from the whole process in this article will be from division. 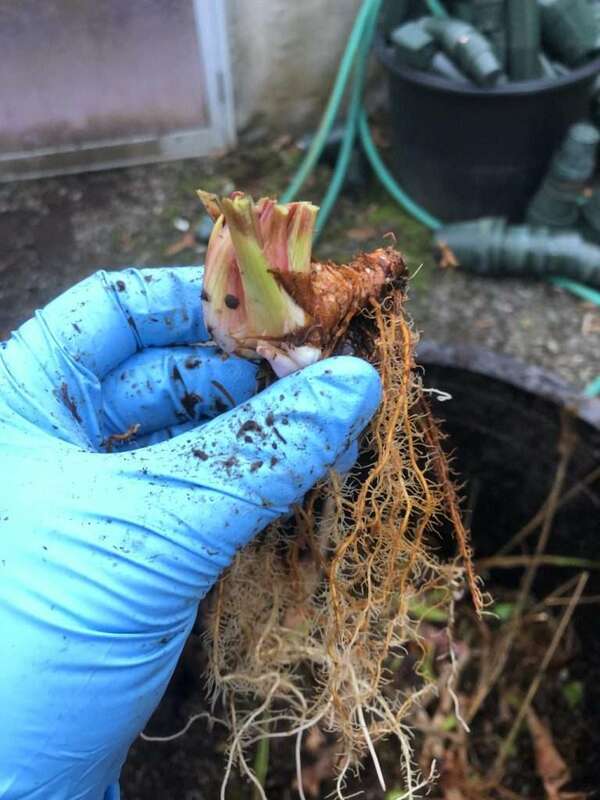 A Sarracenia rhizome, even without any roots, can still take root and grow when treated just like an undamaged plant! Seriously! I’ve seen discarded rhizome bits grow out of water trays, without soil, without attention. That’s how durable this genus is! You can divide your plant if you want to. It’s always more fun to have multiples for trades and sales. 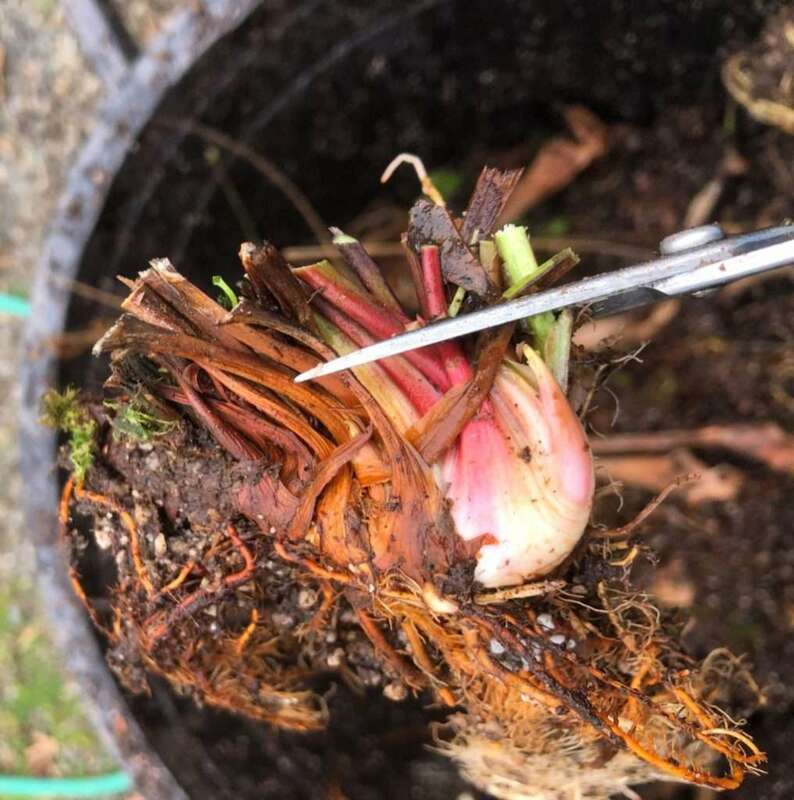 To divide, simply break a section of rhizome off with your BARE HANDS (or cut with scissors, if you’re not a barbarian like me) that preferably includes a good portion of roots and at least one growth point. This is now a new individual plant, which will divide and grow just like any other. Divided plants should not be allowed to flower until they’ve experienced a full growing season to replenish their energy and nutrient reserves. Division requires a lot of healing and forces the new plant to reorganize its budget of nutrients and energy. This makes flowering exhausting for your plant. Remove the buds once you see them. Carnivory will heavily benefit reproduction. It is essential that the insects trapped in the new growing season go to regeneration instead of flower production. 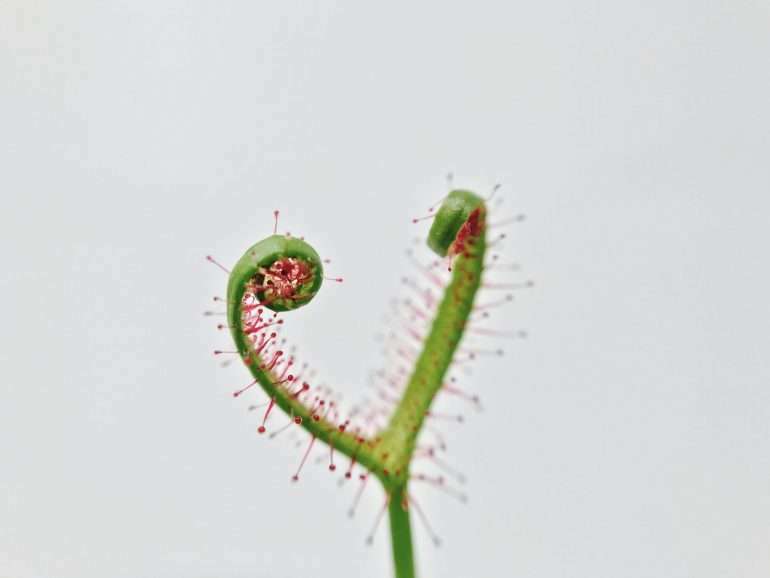 Division can also take the color out of certain varieties, especially S. flava v. rubricorpora and v. atropurpurea, among others. For over a year after division, proper coloration may not return to these plants, and they may even refuse to pitcher. The dazzling cultivar S. ‘Adrian Slack’ is among those plants that may languish for years in a sort of pitcherless coma until putting up fully-developed pitchers after being divided. Warm, humid days (like the conditions in a greenhouse) with careful attention to mold growth, and the occasional addition of a mild orchid fertilizer (Maxsea is a favorite these days) can speed recovery in a plant within to a single growing season. But such conditions aren’t necessary to grow healthy plants. Trimming dead leaves is very straightforward. For Sarracenia, it’s important to note that the rhizome grows horizontally, sometimes branching, along which dead leaves form a sort of “comet’s tail” that precedes the crown (the growth point). To trim, simply keep an eye on the crown proper to avoid it, and cut everything else off, down to one centimeter. You can choose to keep phyllodes or live pitchers (in my experience, it doesn’t seem to matter). I recommend using small bonsai clippers for this job, especially for the finely branched rhizome masses of S. rubra. In the end, do whatever makes it easy for you to avoid cutting the crown. Chop it all off! Tear off those dead leaf stubs to expose the woody rhizome. A naked Sarracenia plant after its once-a-year bath! See how small the whole plant really is? It’s just a bunch of roots and a naked rhizome with a green/red/white growth point. Anything soft and brown can be stripped away – this can save you trouble from pests and diseases in the future. Remember, this isn’t possible or necessary in the wild, but in cultivation it’s something that you may need to do to avoid problems inherent to cultivation down the road. Us growers ought to pamper our plants to keep them as healthy as possible! 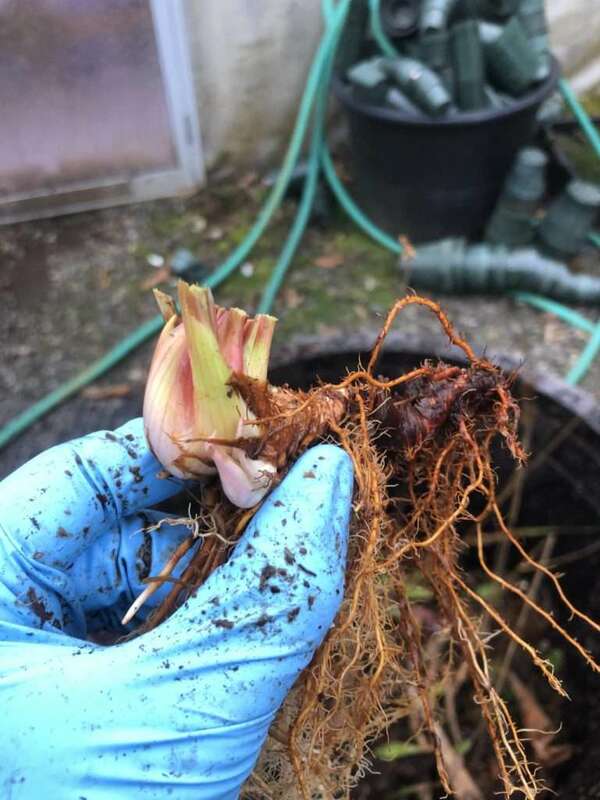 As I remove more soil with the root hook, I dunk the rhizomes in a tub of water and shake them at the water’s surface. This cleans all the old soil off, right up to the rhizome’s base. It’s not essential that all the soil is removed, but if you’re concerned about mineral buildup from your water or just don’t like your old soil, it’s good practice to give your plants a deep cleaning. It’s also a good idea to do this when receiving plants from another grower: washing off soil can remove a ton of potential pests, including mealybug eggs, thrips, mold, and even aphids! 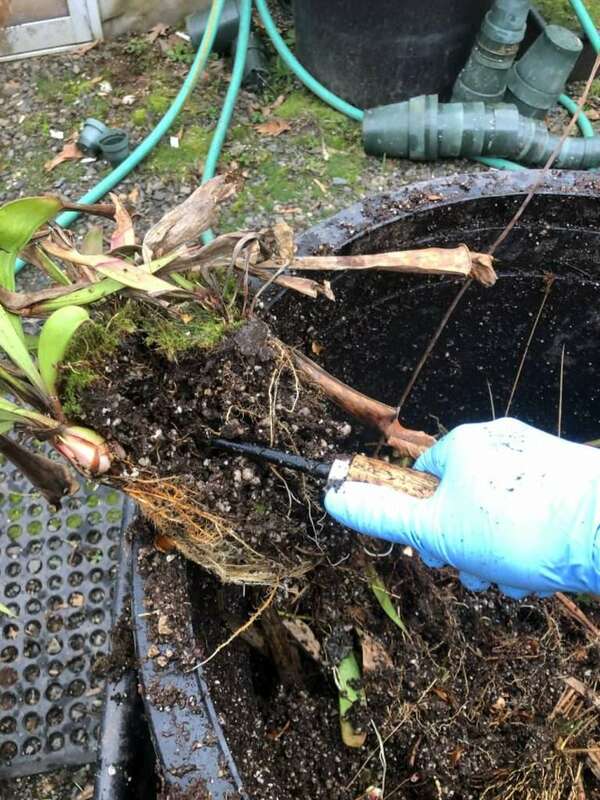 Trimming rhizomes that are too large or which are rotten on one end is another good way to ensure the health of your plant. It also makes it easier to fit a large crown in a smaller pot if need be. Simply cut the dead rhizome chunks off. Leave as many roots as possible, but even if you’re left with a single root or even none at all, your plant can still survive! The size of the rhizome doesn’t necessarily contribute to the size of the plant. 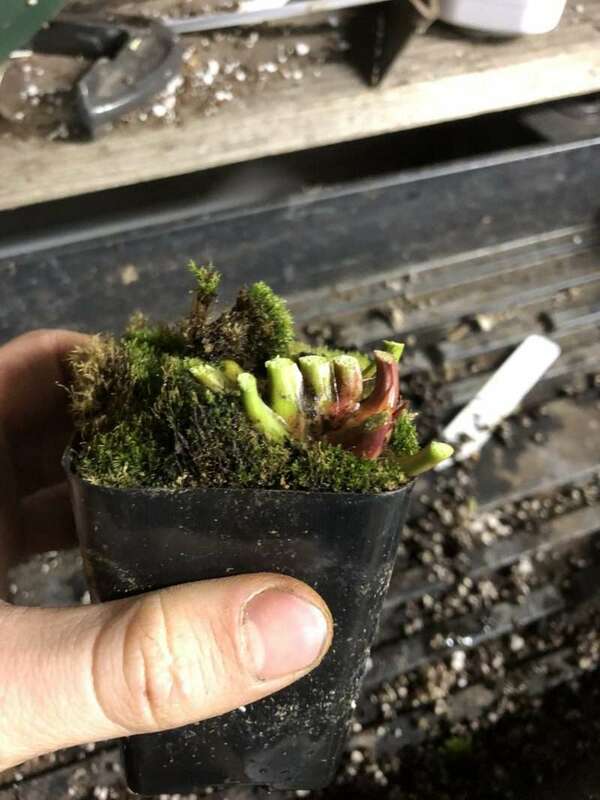 Instead, it’s the size of the crown which will tell you how large the plant will be in most cases (exceptions are the species S. minor, S. rubra, S. purpurea and allies, and most hybrids made with them). This rhizome was too long to fit the pot, so I cut it to around where my scissors are pointing. Chop! But wait, you can do more! This will give me a roughly equal size plant to what I was working with originally. 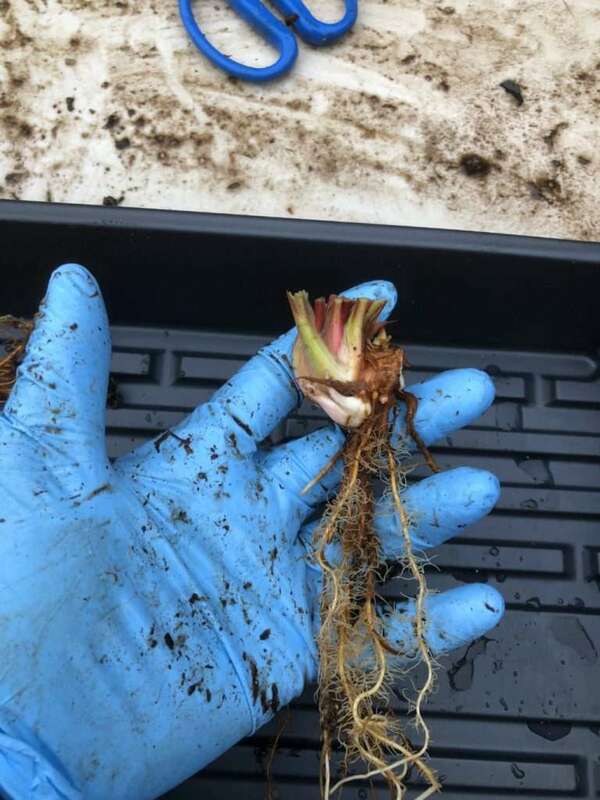 Crown size, not rhizome length, is most important! In my next post, I’ll go over the dos and don’ts about potting up rhizomes. You cut the crown in half! Ouch! 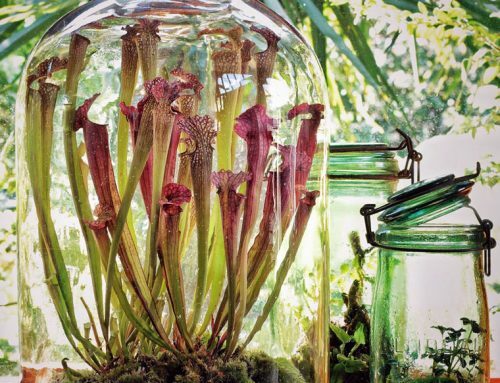 Fortunately, there’s still hope for your circumcised Sarracenia. 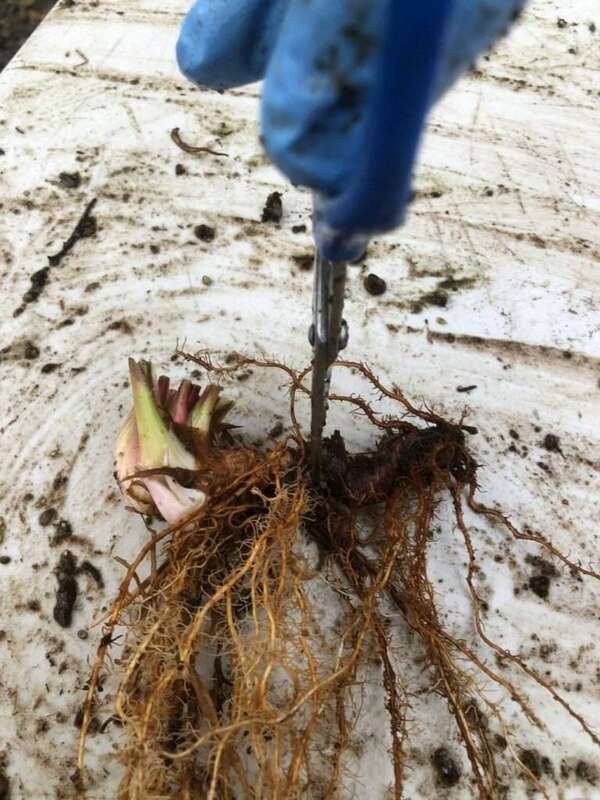 Firstly, remember that if the crown has a root, or if it has even a few millimeters of tough, woody rhizome tissue attached to the cut, you’re still good. The crown can still develop roots. If you busted the crown open and exposed the inner growth point, but didn’t damage it, then you’re also still alright. But if you smashed it like an egg, you need to wait for the rhizome to grow a new crown from a dormant “eye”. The remainder of the crownless rhizome should sprout a new growth point from one of these “eyes” within the growing season. Don’t throw it out until fall! What if you see mold or goo on the base of the plant? Looks like the soil line didn’t get enough ventilation during the winter. Extra humidity probably allowed some fungus to take hold. 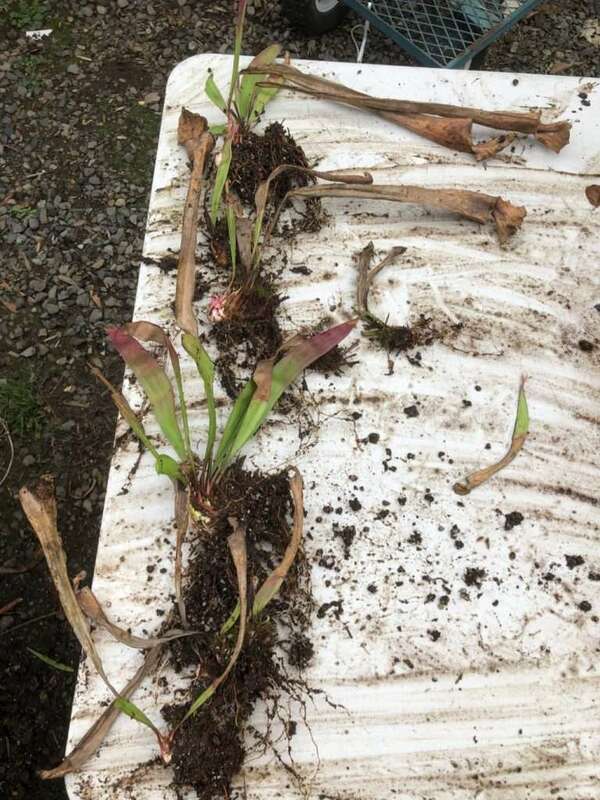 Remove all dead foliage, plucking out as many dead leaf bases from the rhizome as you can. It’s best to repot the plant, spraying it with a sulfur-based fungicide before planting it in new soil. If you need to, remember you can spray with sulfur during any time of the year.